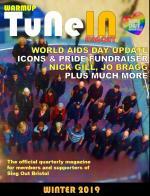 Sing Out Bristol is the South-West’s award-winning Lesbian, Gay, Bisexual and Transgender Community Choir. After our initial incarnation, the short-lived Bristol Gay Chorus, began (and ended) back in 2007, a few determined singers started to meet in each others' homes. By 2008 this small group had grown to the point where we needed a dedicated rehearsal space, and we found a home at Jubilee Hall in Bedminster. Soon after, we adopted our Constitution, held our first AGM, and the decision was made to call ourselves Sing Out Bristol. We soon outgrew Jubilee Hall and moved to our current home in the centre of Bristol. There have been many milestones and highlights along the way (see our History page, for more details). Now, in our 10th anniversary year, we have a hugely diverse membership made up of over 120 people of all ages, nationalities, orientations, abilities, genders and backgrounds, coming together on a weekly basis to sing, socialise, and connect. Put simply, we enjoy singing and want to do it in a space where our orientation and/or gender isn't an issue. Although we're definitely a performance choir, there's no pressure on members to perform, some just come along to rehearsals to sing and have a chat with friends. Anyone choosing to perform, however, will be treated to some of the best stages the area has to offer. As well as our regular Bristol Pride appearances, we've perfomed at various other Prides in the South-West and our annual Bristol concerts have taken place in such venues as The Victoria Rooms, Anson Rooms, Redgrave Theatre and more recently St George's. We've also taken part in shows in The Bristol Hippodrome, Bristol Old Vic and Colston Hall as well as various night clubs and smaller venues and open air spots around Bristol. We've even performed on The Matthew whilst sailing along The Avon, in someone's living room on TV for an episode of 'Come Dine With Me', inside Southmead Hospital and at two prisons in the area as part of our outreach work. This work has also taken us to various schools and youth organisations, where we talk about the choir and how it supports and contributes to the LGBT community in the Bristol area. We've travelled extensively to take part in LGBT choir festivals in Brighton, London and Dublin and Manchester. In May 2018 we joined 90 other choirs from around the world at the biggest ever festival of LGBT choirs, Various Voices, in Munich. We sing! Rehearsals provide a safe, non-judgemental, welcoming place for members to come together on a regular basis to sing for pleasure in a relaxed learning environment. We welcome people at all levels of singing ability and we don't audition. Whether you've literally never sung before or you're a seasoned performer, you'll be welcomed with the firm belief that together we sound amazing! We perform regularly, both at our own Concerts and at community events that match our aims and objectives. While performing is completely optional, our rehearsals are naturally geared towards learning songs for these events - we want to sound our best in public! We sometimes include 'moves' in our more up-tempo songs. It's something we like to call choralography and it involves simple but effective step and arm movements that are easily learned but really enhance our performances. We're also proud to have a BSL Interpreter on stage with us who signs every word of our annual concerts. As well as the main choir, in recent years we've created a smaller choir, Little Sing Out (which is auditioned) to perform at paid gigs, helping to support choir funds. We support the LGBT Community in a variety of ways - by donating performances to Community Events across the South-West, by donating a percentage of any money we make from performances to our chosen charities, and by representing the LGBT Community to the wider public across South-West UK and beyond. We were honoured to be asked to perform at the vigil in College Green Bristol for victims of the Orlando Pulse nightclub massacre in 2016, and we've been the opening act at Bristol Pride every year since 2009. We support each other - collectively we're much more than just singers, we're a community in and of ourselves, encouraging each other to grow and develop as people, to form friendships, networks and social groups, and to grow in confidence and ability. We currently have a small number of refugee members who came to the UK to escape persecution and have found a safe place and enjoyed new experiences with us. We constantly develop - As the choir has grown and expanded, we've continued to develop as an organisation. Our charity status gives opportunites and responsibilities that we take very seriously. Members are encouraged to get involved in the development of the choir by joining the 12 person strong committee, or one of the many groups that contribute to the day-to-day running and development of the choir. These range from the amazing Music Direction (MD) team, Choralography team, Creative team (who plan our performances), Communications team, Outreach team, and occasional groups that are formed for specific tasks such as developing our strategy or creating new policies. We rely entirely on volunteers (although there is renumeration to reflect the work the MD puts in), and as such there are other ways to contribute to the choir, from helping to set up equipment to buying the tea and coffee. We really are a family that is greater than the sum of its parts! We rehearse every Tuesday evening at an accessible venue in the centre of Bristol. In the run up to major performances we also hold regular section rehearsals in other venues. Three times a year we open our doors to hold New Members Evenings, where anyone is welcome to come along (with prior notice) to experience how we operate. As mentioned there is no audition, so if you come along you can expect a very warm welcome, with tea and cake, along with a short performance of some of our more recent songs and a demonstration of how we learn to sing together. For more information, visit our JOIN US page. We also meet socially on a regular basis, at family-friendly events organised by the choir's Social Team and more informally for smaller events organised within the membership. Among our regular events are an annual quiz night where each section in the choir competes for the coveted Sing Out Trophy, a Summer Picnic on The Downs, Treasure Hunts, Karaoke Nights, 10 Pin Bowling and other informal social evenings. There's no expectation for members to attend these events, but they are there for those who want them. We'd love to see you at our next New Members Evening, or at one of our performances...!